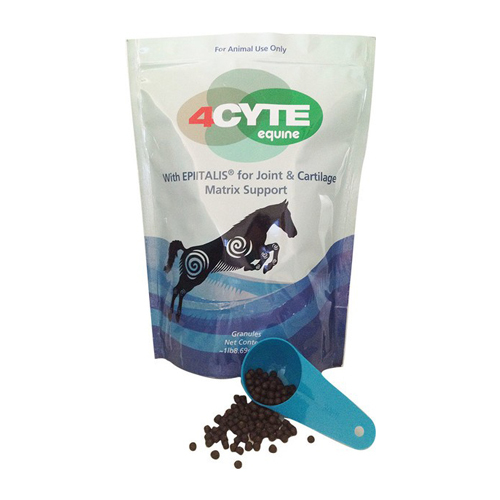 4CYTE Equine is an animal food supplement in the form of small granules for horses to support joint flexibility and mobility. 4CYTE Equine is a unique product to support healthy joints in your horse. It contains Epiitalis®, a patented extract of plant oil with the ability to promote cartilage regeneration. By actively stimulating cartilage cells (chondrocytes and synoviocytes), the balance between the production and breakdown of the cartilage is tipped in favour of the production of new cells. 4CYTE Equine is suitable for older horses and competition horses. In addition, it can be used for joint problems, injuries and in pre- and post-operative situations. Recovery: Proven chondrocyte proliferation to promote cartilage generation. Prevention: Proven prevention of joint breakdown. Preventive use of 4CYTE Equine reduces the central inflammation mediators that are responsible for the cycle of joint inflammation and breakdown. Protection: Proven protection of healthy cartilage. 4CYTE Equine contains many naturally occurring glycosaminoglycans and Omega-3 fatty acids. These are essential for the production of cartilage. 4CYTE Equine causes an increase in the viability of the cartilage cells. Relief: Proven anti-inflammatory effect and possible painkiller. 4CYTE Equine reduces the production of central mediators of inflammation and pain (PGE2 and nitrogen oxide). The use of 4CYTE Equine reduces inflammation in the affected joints. Administer orally once daily with your pet's normal feed. To improve the flavour, the granules can be made smaller and possibly mixed with a binding agent such as molasses. Start with 1/4 scoop (included in the packaging). Slowly increase the dosage until you reach the recommended dosage of 21 grams (= 1 level scoop) per day. After this, administer 21 grams per day for 4 weeks. Then reduce to the daily maintenance dosage of 1/2 scoop per day. To give you an indication: 700 grams of this product is sufficient to give a 600 kg horse the maintenance dosage for 67 days. Epiitalis: vegetable oil extract, which has the ability to proliferate chondrocytes and promote cartilage generation. New Zealand Green Lipped Mussel: an important source of poly-unsaturated fatty acids and amino acids that help regulate the chemical mediators in the joints. Marine cartilage: natural source of glycosaminoglycans, which are essential for a healthy synovial fluid and cartilage. Abalone: source of Omega-3 fatty acids, which help maintain healthy cartilage cells. Have you used 4CYTE Equine before? Let us know what you think about this product.